I've dedicated the next few days to listing new items and relisting in my Etsy Store. I am also trying to use what spare time I get to work on a small little e-commerce site separate from Etsy. It's absolutely nothing against Etsy, their great but I want something of a fallback I guess. Somewhere I can go in the event that one day I become so disenchanted that I can't handle it anymore. Or something. This is my dyed silk. I could never quite get the picture right before. 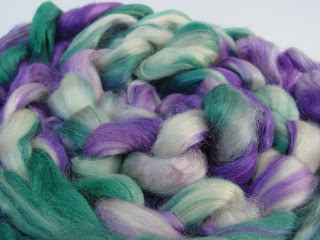 It hit me while I was out there not to treat it like normal wool roving. The braid would just make the silk cling to itself with each pass. Instead, I did a crochet like chain using my hand. It makes it ver pretty and a lot easier to handle with out the loose fibers getting everywhere. If someone wanted to loosen it, they would just need to untuck the end piece and pull. Each loop should fall out one by one. I will also have a little promotional and re-opening sale sometime between now and April 10th.